Skanska announces that it has won WELL Core & Shell certification for the Visionary Gold Project. This prestigious award was awarded to it by the International WELL Building InstituteTM (IWBITM) according to its WELL Building StandardTM (WELL) rating. It is the highest building standard that focuses on improving the health and quality of life of people in what buildings they live, work and play. 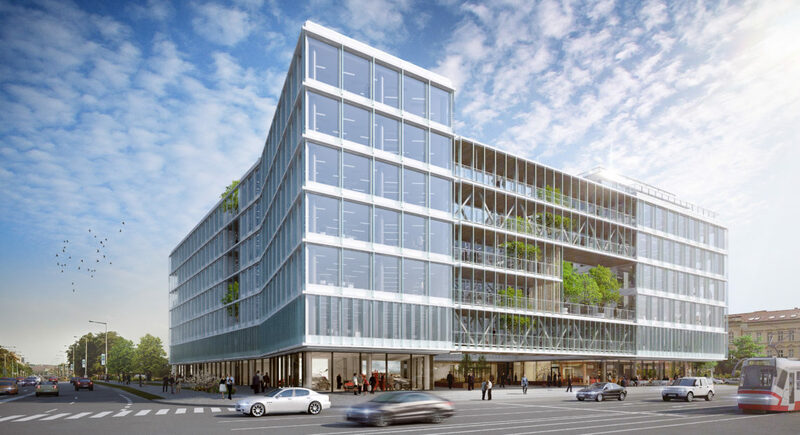 Visionary, a top office project in Prague-Holešovice, is the first building with WELLTM certification in the Czech Republic and Central Europe and the 24th building with this certification in the world. At the same time, Visionary is the greenest office building in the Central Europe region, which was awarded 95 LEED Platinum certification shortly after its completion last year. WELL certification has been established over the past seven years on the basis of research and development by leading physicians, scientists and real estate professionals. It is based on tracking concrete results and combines best practices in design and building buildings with evidence-based scientific research . Visionary has won Gold for its seven air, water, light, nutrition, fitness, comfort, mind and innovation awards. “Visionary has shown future developments in several ways. With the project we have introduced a new location that successfully establishes itself in the Prague office space market. The building received a high score (95) in LEED Platinum Core & Shell certification, making it the greenest building in the Czech Republic and Central Europe. In addition, Visionary also became the first WELLTM building in our region, ” says Alexandra Tomášková , Director of Skanska Property Czech Republic . “We are proud that the cooperation in the Skanska Group on WELL certification confirms that sustainability and health is our priority. During the construction, we focused on the selection of materials that meet strict health requirements. The future of green construction lies in the close cooperation of all parties involved in the design and implementation of the project itself. We succeeded in this and we know that we will use our knowledge and experience on other construction projects, ” says Michal Jurka , President of Skanska Czech and Slovak Republic. Light - Natural light is available for 85% of all regularly used spaces. The project was designed so that the large façade panels let the maximum of daylight pass. 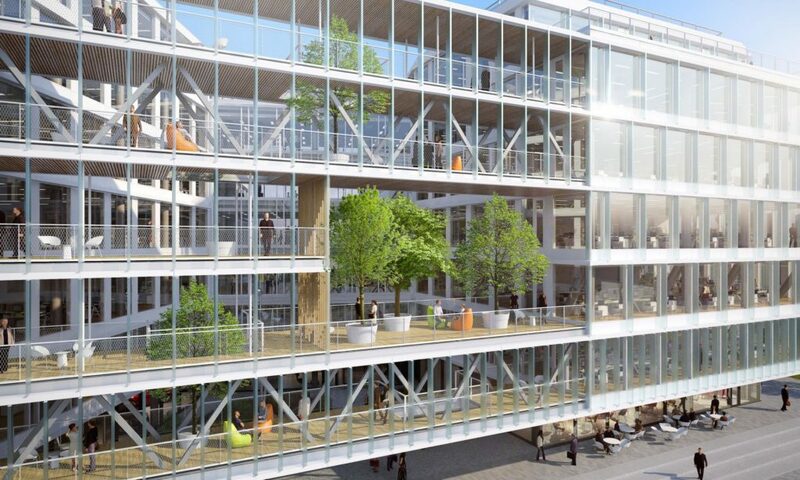 Mind - Flexible spaces: the building has a number of terraces and balconies with seating, trees and armchairs that employees can use during breaks and lunch breaks in the fresh air. Outdoor areas: an atrium with a wooden terrace can be used by tenants, visitors and the public. Movies can be shown in the outdoor cinema in summer. Included in the building's design are biophilic elements such as a staircase that resembles a conch, a railing like bamboo, and flower-shaped lights. 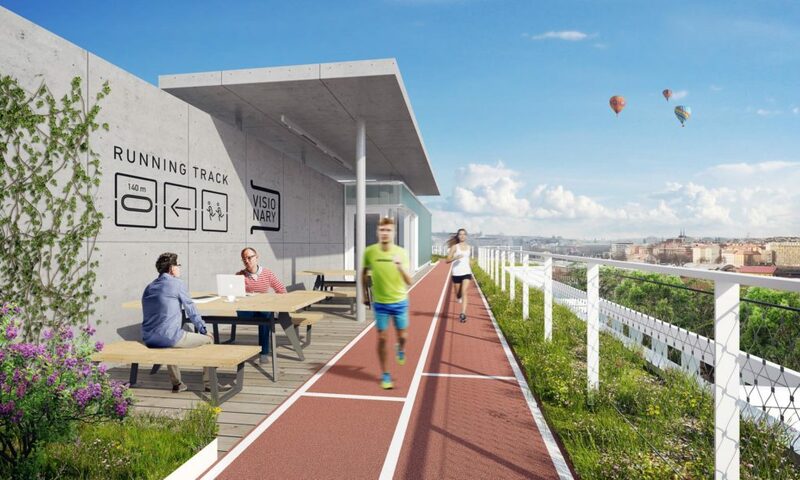 Fitness - A running track on the roof offers the opportunity to relax actively throughout the day. Outdoor green areas including a multi-purpose playground and fitness features are accessible to employees and the public. For cyclists, the building offers bicycle racks, a cloakroom and showers. Innovation - The Visionary mobile app includes services in the building and informs about what is happening both in the building and in its surroundings. The owner of CA Immo pledges to educate tenants, real estate specialists and the general public about the WELL principles. The kindergarten, which was opened in Visionary, serves mainly Prague 7, but it also offers several places for pre-school tenants. Visionary is a top office building in Prague 7 Holešovice, now owned by CA Immo. 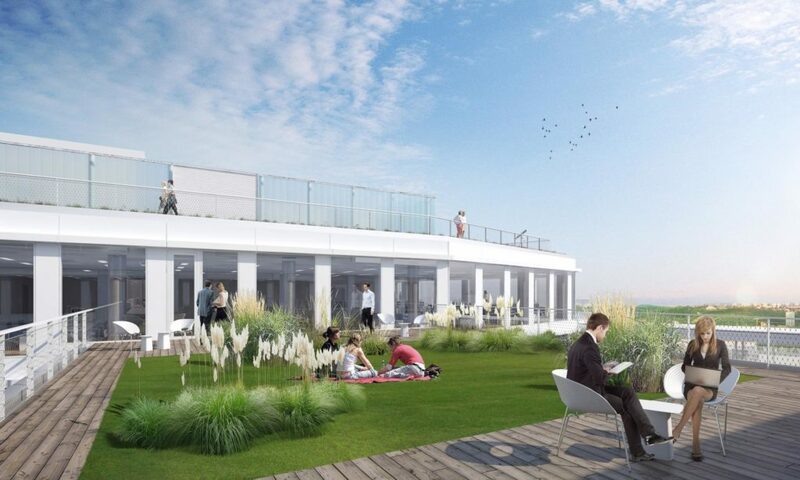 It offers 22,500 m2 of Class A office space, which is 100% leased to prestigious tenants. In the retail area, there are medical offices, a pharmacy, a health food store and the Vision Café. Everything is available to both tenants and residents of Prague 7. WELLTM is based on evidence-based research and focuses on building connections where we spend about 90 percent of our time, and our health and well-being. Visionary, which has been certified by WELLTM Core & Shell, has met all the requirements that Green Business Certification Inc. has imposed on it in challenging testing and final evaluation (GBCI), certification body for WELLTM.